Ronda Rousey, Womens Bantaweight champion. There’s no doubt that women are gradually climbing up the ladder and dominating the MMA world. Women work just as hard as men do and are finally receiving the recognition they deserve. While there’s many of talented women who have came out victorious, one person stands out, that person being Ronda Rousey. Rousey remains the Women’s Bantamweight Champion (Fighting class of 135 pounds). Rousey’s pro debut came less than four years ago, and the 28 year old has already taken the sport by storm, both in and out of the octagon. Rousey is the only fighter in history to earn both an olympic medal and a UFC championship. To add to her overachieved list, she is also one of six fighters in UFC history to win a championship with an undefeated record. She has never been knocked down or submitted with her recent fight lasting only 14 seconds, meaning that her total time in the octagon after 11 pro fights is 25 minutes and 2 seconds. There is no doubt why Rousey has managed to take UFC by storm. As if she could not top herself yet again, she managed to do just that as she submitted Cat Zinganos in her fastest win ever. A fight which only lasted 14 seconds of the very first round at UFC 184 on Saturday night in Los Angeles. A fight that had been long overdue, Zinganos came at Rousey throwing a flying knee to the body in the first opening seconds. It did not take long for both of them to hit the mat. From a perspective view, Rousey had control at all time. She quickly flipped over and snatched up a straight arm bar. 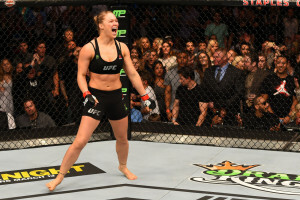 Rousey celebrating her fastest win in UFC History against Cat Zingano. After completely spinning around and tucking her opponents limb behind her back, she hyperextended it, forcing the tap-out. And just like that Rousey remains Champion. Extending her perfect score to 11-0. Making this Zinganos first loss in her career, setting her record at 9-1. It was all Judo and she is the fastest one. There is no doubt why she manages to posses control everytime they hit the mat. Although Rousey has managed to defeat everyone in her divison, she still has two women in mind. The first being Holly Holm who also went home victories. 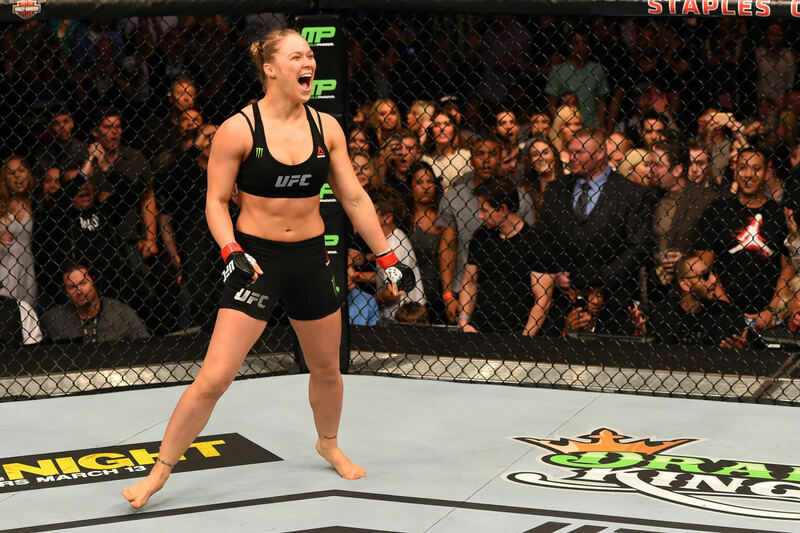 “I was really impressed with Holly Holm tonight,” said Rousey. She also called out Correira as she mentioned, “Bethe Correira, shes undefeated. I’d like to take that ‘0’ from her. Congratulations to Rousey, I definitely would never want to face her in a match. Did you catch the fight? What are your thoughts? Chrissy Teigen and John Legend Expecting First Baby!